The French sculptor and graphic artist Bernar Venet was born in a village in Haute-Provence in 1941. At the age of seventeen, a precocious artistic vocation took him to Nice, where he studied drawing. He first came to notice in 1963 with his tar paintings and cardboard reliefs. During the 1960s, having become a leading light of conceptual art, Venet discovered the true source of inspiration for his future work: the mathematical diagram, whose axes, curves and equations he reproduced on canvas. However, he interrupted all creative activity from 1971 to 1975 to take a long break devoted to reflection and teaching. 1976 marked a new departure. Dividing his time between New York and Provence, where his property at Le Muy would provide the setting for an extraordinary personal museum, Venet started exploring a new material, raw steel bars, taking advantage of their monumental possibilities. He worked them in “lines” – straight, curved, broken, oblique or even “indeterminate”. These random coils would make him famous all over the world, imposing his characteristic style in numerous collections and in prestigious locations in the United States, Germany, Japan and France. In Paris, one of his works adorns the La Défense business district. Two significant milestones in his career came in 2009 with his Disorder exhibition in Brussels and his participation in the Venice Biennale. 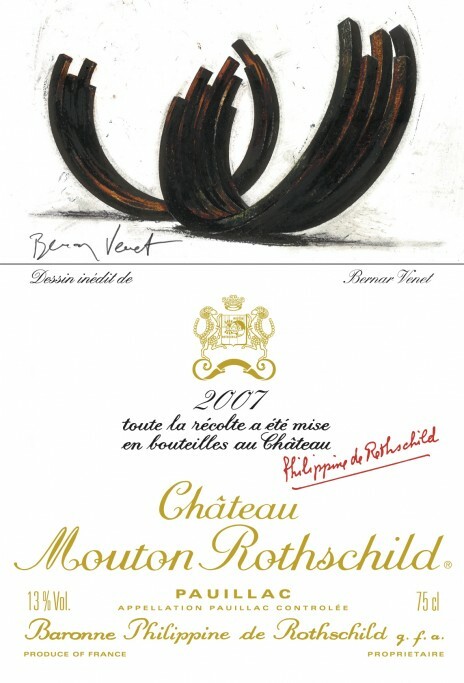 While suggesting the swell of a barrel, the arcs he has drawn for Mouton 2007 evoke chalices rooted in the earth and open, like vinestocks, to the precious gifts from above.